Torn Ranch Rose Dried Fruits & Nuts Gift Pack... not only beautiful in presentation, the classic Rose dried fruits & nuts gift pack is hand assembled into the shape of a rose. This signature Rose gift pack is abundant in the variety of sumptuous dried fruits & nuts. Torn Ranch uses only the finest dried fruits & nuts from California's lush, fertile valleys. Torn Ranch... a leader in the gourmet industry for over 30 years!!! 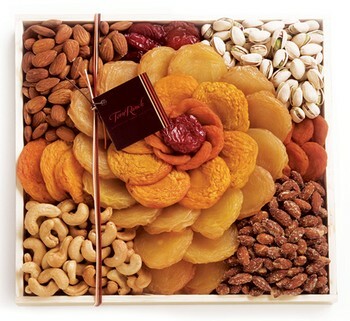 The Rose dried fruits & nuts gift pack includes: peaches, jumbo pears, apricots, smoky almonds, ruby red plums, jumbo almonds, jumbo cashews, & California colossal pistachios in a wooden tray. Torn Ranch Rose Dried Fruits & Nuts Gift Pack.